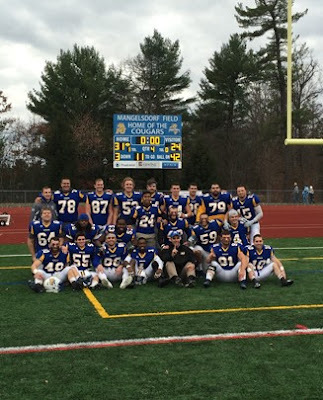 Playing their final home game of the season, the Misericordia University football team gave their seniors an emotional 31-24 win over Wilkes on Senior Appreciation Day, Saturday afternoon at Mangelsdorf Field. After recognizing the 21 remaining members of Misericordia's first football recruiting class in a pre-game ceremony, the Cougars carried the momentum into the game as they raced out to a 14-0 first quarter lead and never trailed. Senior quarterback Jeff Puckett broke the school single-game passing record for the second straight week with 253 yards and a touchdown. Puckett added two scores on the ground on a 109 hard-fought rushing yards. Puckett set another school record with 29 completions as he spread the ball to eight different receivers. Sam Gillison had a team-high 99 yards on a new school record 11 receptions. Ryan Kurtz added 64 yards rushing, including a touchdown and Tom Stelzer had a touchdown reception. Tyler Collins had six tackles and an interception and Hunter Pates had six tackles to lead the MU defense. Jared Harris had four tackles and three pass breakups. After Zak LaNunziata returned the opening kickoff 18 yards to the 33 yard line, the Cougars went 67 yards in just 3:48 to take a 7-0 lead. Facing third-and-7, Puckett hit senior classmate Tyler Rowe on a quick out for eight yards and a first down. Sam Gillison took a screen pass on first down 12 yards into Wilkes territory. After Mark McMaster took a quick out down the right sideline for a 17-yard gain, Gillison broke a tackle and raced 24 yards down the left sideline to the Wilkes one yard line. Kurtz plunged into the end zone on the next play for the game's first score. The Cougars forced a three-and-out on Wilkes first possession and went on another lengthy scoring drive. Facing third-and-5 at their own 44, Puckett picked up six yards on a quarterback draw to the 50. Puckett broke a tackle and went 16 yards on another draw on the next play for a first down at the Wilkes 35. Isaiah Solomon's nine-yard reception set up second-and-1 at the Wilkes 26 yard line, but the Colonels defense stopped Puckett for no gain on the next to plays. The third time, however, was the charm as another well-executed quarterback draw went for five yards and a first down at the 21 yard line. Kurtz gained five yards on first down and then bounced outside and broke a tackle on the right edge to set up first-and-goal at the 10. Puckett connected with Juwan Petties-Jackson for seven yards and Kurtz picked a yard on second down. Puckett faked a draw on third down and pulled up to find tight end Tom Stelzer in the back of the end zone for a 14-0 lead with less than two minutes to play in the opening quarter. The teams exchanged punts with Puckett's pooch kick on fourth-and-25 pinning the Colonels at their own eight yard line. The Colonels used two receptions to move to the 40 yard line and then Ryan Dailey connected with William Deemer for 38 yards to the MU 22. Dailey eventually hit Deemer again for a nine-yard TD to make it 14-7 late in the second quarter. The teams traded punts with the Cougars taking over at their own 45 with just 1:06 to go before halftime. Gillison had a seven-yard reception and Tyler Rowe's quick out went for eight yards to set up first and goal at the Wilkes four. Facing second-and-goal with just eight seconds remaining, Puckett broke two tackles to get around the right end and lunged inside the right pylon for a 21-7 lead with just two seconds left in the half. The MU defense forced a three-and-out on the first series of the second half, the Cougars managed just 24 yards on the ensuing drive. Pat Newins' 54 yard punt pinned the Colonels at their own two yard line. Dailey connected with Deemer for 64 yards to ignite a 98-yard scoring drive to pull within 21-14 with 7:59 to go in the third quarter. MU started at their own 47-yard line after the Wilkes kickoff went out of bounds and the Cougars took advantage of the short field. Isaiah Solomon's 14-yard reception moved the ball to the Wilkes 33 and Petties-Jackson took a screen pass 11 yards to the Wilkes 16. Kurtz and Puckett combined for 11 yards on three carries to set up first and goal and Puckett went up the middle for a five-yard TD and a 28-14 lead with 3:01 left in the third quarter. Wilkes answered with a 10-play scoring drive, despite a solid stand by the MU defense inside their own five-yard line, to get within 28-21. Zak LaNunziata raced up the middle for 33 yards on the kickoff and Puckett moved the ball across midfield on a 12-yard run on first down, but was stripped of the ball and Wilkes took over at their own 48. The Colonels moved into MU territory before Brian Hart forced a fumble and Tyler Collins recovered for the Cougars at their own 20. Gillison sandwich two catches for 22 yards around two carries by Kurtz that went for 13 yards to move into Wilkes territory. Kurtz bounced outside for a 17-yard gain to the Wilkes 11, but the drive stalled and the Cougars settled for a 22-yard field goal by Ryan Davis to take a 31-21 lead with 6:20 to play. Wilkes added a TD with under a minute to play to get within a touchdown, but the Cougars recovered the onside kick and ran out the clock. MU will wrap up the 2015 season at Lycoming, Saturday.